Why not start the day with Breakfast in Deepdale Café, then the Festival kicks off at 10am on both Saturday 20th and Sunday 21st April. For those with a head for heights, why not try the free Climbing Wall or take a bounce on the Bungee Trampolines, both available throughout the weekend. As inspiration hits, Paul Kelly will be creating wildlife inspired Chainsaw Carvings throughout the weekend. Alyson from Deepdale Bike Hire will be leading Beach Combing Guided Bike Rides to Brancaster Beach on both Saturday and Sunday. The National Trust Activity Centre team will be running taster Orienteering sessions from Dalegate Market to Barrow Common. Steve Rooke from Sunbird Tours and the One Stop Nature Shop team will be running short Guided Birdwatching Walks on the Burnham Deepdale marshes, an excellent introduction for the novice birder and those new to the beautiful North Norfolk Coast. There will be guided tours of the facilities of Deepdale Backpackers & Camping, including the backpackers hostel, tipis, yurts, shepherds huts and campsite. On Saturday, Active Norfolk will be running free Archery taster sessions for anyone who’d like to test their aim. Sunday sees the first Deepdale Dog Show, which is open to all comers. Maybe your four legged friend would win one of these fun categories: Prettiest Girl, Handsomest Boy, Most Appealing Eyes, Dog the Judges Would Like to Take Home, Best Family - More than one dog in the household, Most Appealing Expression, Film Star, Best in Show. There will also be Dog Agility demonstrations and taster sessions. Solemates Walking & Social Events will be running a FREE 6 mile Circular Guided Walk on Sunday morning. In between all these activities there are over 35 stands and shops to visit, explaining the local wildlife, where to walk, cycle and be active, plus offering some great outdoor and wildlife items to purchase. It’s going to a really superb weekend and with plenty for everyone, whatever level of interest you have in the great outdoors and wildlife. We look forward to welcoming you all to our beautiful part of the world, the North Norfolk Coast, specifically to Dalegate Market in Burnham Deepdale on Saturday 20th and Sunday 21st April. 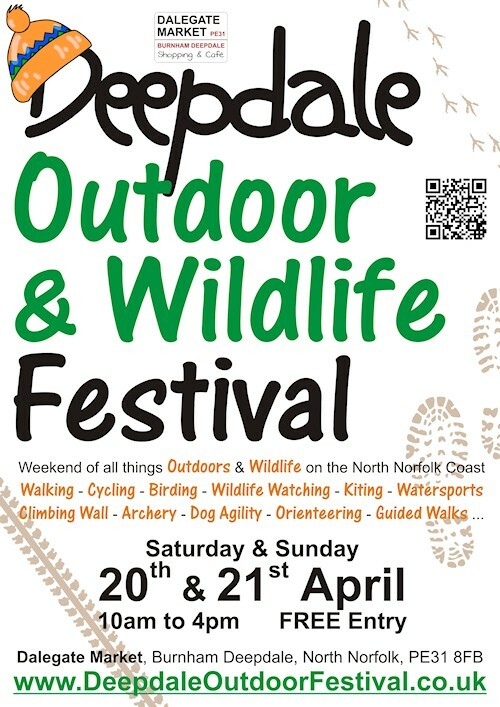 A full programme can be found on the website: www.deepdaleoutdoorfestival.co.uk and will be posted prominently at the Festival.